Dr. Charles Perry at Middle Tennessee State University continues driving toward success in the development of the plug-in hybrid retrofit kit for any car. Dr. Perry, his collaborators and students are very close, very close indeed. MTSU Wheel Hub Motor Retrofit Kit. Click image for more info. Perry, who holds the Russell Chair of Manufacturing Excellence, and this year’s five-member team saw gas mileage increase anywhere from 50 to 100 percent on a 1994 Honda station wagon retrofitted with laboratory prototype plug-in hybrid capability. 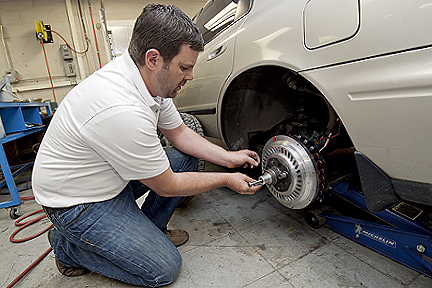 MTSU’s Jay Perry installs a Wheel Hub. Click image for more info. The technology’s gas-saving principle uses a pair of electric motors to supplement the power coming from the internal combustion engine. Dr. Perry is now talking with several potential investors – companies with vehicle fleets – to solicit funds to build and demonstrate a manufacturing version of the plug-in hybrid technology. He understands they have reached what industry insiders call “the valley of death” as they try to transfer the project’s technology from the laboratory to a commercial product. Automobiles are a world wide vastly varied industry. Perry and Svendsen might well keep in mind the aftermarket segment, smaller automotive producers, and wide array of mobility manufacturers. The team might not have the highest motor technology, but they do have the widest and farthest reach for immediate adoption. They’re in better shape for traversing the “the valley of death” than most ideas. * Dr. Ron McBride was a consultant and oversaw student involvement in the machine shop. The nine students have all graduated with bachelor’s or master’s degrees. The quick list includes, Alex Kirchoff, Ken Garrett, Brian Mastley, David Gray, Jay Perry (not related to Dr. Perry), Brent Brubaker, Ken Gendrich, Brandon Cromwell, and Suneth Wattage. More details are in the university press release. Obviously it’s more complex than swapping out the brake backing plate and brake drum. There will be a bit of kit to install for the batteries controller and wiring. $3000 could be a viable number with volume. If they get into the market, as sure as night follows day competition will sprout and the modifiers will get involved and before long, a market share will build. This one should take off. Your humble writer could buy something like this . . . If the motors are strong and efficient enough an EV could be in my future! WooHoo! Will this system work with rear disc brakes? I met a man in VT that had retrofitted his pickup truck with a lithium-ion battery. His description of how he did it made me wonder if picking up something to do the same thing would work. Thanks for the post, btw. I’m in a position to install a pair of these wheel motors on a vehicle and would like to be on a team to build the field testing and performance necessary for certification and production. I will pay for the necessary materials. Please advise on the feasibility of this. we are israeli students /we want to convert the propulsion car – subaru justy _ from gasoline engine to electrical .we want to buy two wheels motor 48V 10 KW and controllers.please send us your price. thanks. We are from Thailand. We are interested to convert the car and buy one complete kit please send us your price. Looking to convert my 65 Mustang. Please contact me, I’m in the DFW area. A have a cla Mercedes & Crysler sebring cabrio to do this. Please inform me about buying your machine. I want to upgrade may car. I’m open to options: build from kit and field testing with data logger ( paying for materials) or I can purchase the whole kit if it’s available . I’m in California. Please let me know. This is a heavier duty product of the same drives used on electric trikes & electric motorcycles & scooters. Paul Meister in Costa Rica can probay use an existing kit already on the net for his Piaggio APE. I would love to put a 2 hubwheel kit on my van soon as it is available. This is what the small business must have from pest controll to pizza & auto parts delivery to stay alive with irresponsible government messing up the economy. Bill Warren Good luck Paul. We are a Leading Group of Companies in India, having three Textile Units under our banner and are also job work converter for companies, like, LG, Samsung, Sony etc. having a total turnover of more than 200 million USD PA.
We are interested to import retrofitted hybrid kit for cars into India. You are requested to let us know the full details of your kit as well as what is the success rate of your kit. 1. Since how long you have been manufacturing this kit? 2. How many kits you have manufactured now? 3. What will be the CNF price of the same? Please give us as much information to study the subject so that we can precede this matter. I’m not too sure what the point of the system is. I heard no mention of regenerative braking where the KE of the vehicle is converted into electrical current to re-charge the battery which make a real hybrid attractive. This system apparently needs to have its battery charged from 120VAC current which has a cost both financially and environmentally. Time to build a three wheeled motorcycle…all electric. Enclose the cab and use it for everything in the city. Please advice me where I can buy this kit, because I would like to sell it in Europe. Please inform me were this kit can available in India. Hye, where can i buy this kit ? Greetings from Australia. I have been inspired by the plug-in hybrid kit you have developed. I purchased an early Packard a few years ago, the sales clip which is still on Youtube at https://www.youtube.com/watch?v=ycZ3_bDwbO8 if you are interested in viewing it. I would like to replace the dinosaur engine altogether with in-hub motors like yours which supplement the engine, but I would like to go further and eliminate the original engine and gearbox and hope to devote the weight saving of the current drive train which is about half of the car’s over two tons mass to battery storage. I currently do weddings for young couples at the church I attend, and crawling around in the traffic distresses me because I know I am polluting more than most. May I please ask you if you think the same principle you have used may do the job? 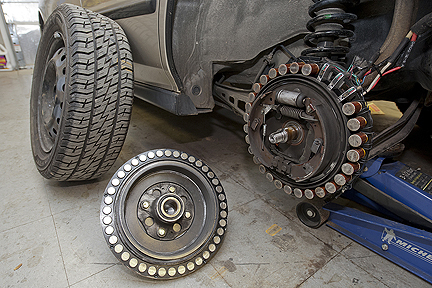 The car has 16″ brake drums and the wheel internal diameter is 20″ so there is a little room to move there. Many would see it as sacrilege, but the engine would be kept and set up on a stand for display purposes and if some future purist wants to redress this experiment, it can still be achieved. I drove the car 3000 miles after I purchased it in Portland, OR because I wanted to see some of your natural wonders so I proceeded down the Rockys from Yellowstone to the White Sands Monument over 10 weeks before I brought the car back here. What a great country you have: GOD BLESS AMERICA!!! Send me your email please, i need to speak with you about this motor. This is surely a good vechicle. But meanwhile here in my country Singapore, this is surely no possible to convert. I hope this plug-in Hybrid retrofit kit get a lot of Investors and I think this invention can be a good feature to add-on electric cars. This is an interesting hybrid car. We have our own hybrids in Sembawang Singapore too. Will love to be an agent for you guys here in RSA. I am absolutely sure it will sell very good over here in the Netherlands, where hybrid car sales are big! Not everyone can afford such a car, so this system could fill the gap. I left school at age 16 to pursue ‘Vocational’ further eduction, rather than pure academic. But that was 45 years ago. Many things have changed, especially in Electronics, Computers, and the Internet. My love of motorcyles has not changed, but I have a growing interest in electric powered 2 wheel transport, which is BIG in China (where I have been living and working for past 4 years). There are many ‘scooters’ in China cities, that have brush-less electric motors, in the rear hub. On Alibaba, one can find these Hub Motors from 500W to 1KW to as high as 2KW. I was interested to read about this rear hub conversion (of FWD vehicles, and/or RWD also?). I am considering buying, a used Yamaha “”Tricity. Then fitting a brush-less electric rear hub motor ‘conversion’ after I have researched more into these Chinese Electric Hubs (with disc brake mounts for rear hub), and the Controller etc. Fitting brush-less electric hub into front wheel of conventional motorcycles, is probably easier perhaps? Thanks for posting details of this Project, it has inspired me to ‘dig deeper’ and pursue my dream of cheap ‘Hybrid’ Conversion (and fitting Solar Panel – Roof – another reason for 3 wheeler). Are the kits still for sale and where can one make a purchase of a kit? Please send to my email the links to your system. Thanks. Where is the project right now? Can you provide a URL where I can follow the progress?